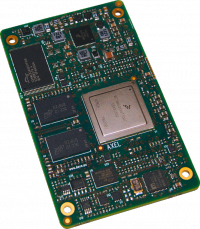 Axel Esatta is the new top-class Single - Dual - Quad Core ARM Cortex-A9 CPU module by DAVE Embedded Systems, based on the recent NXP/Freescale i.MX6 application processor. Thanks to AXEL ESATTA, customers have the chance to save time and resources by using a compact solution that permits to reach scalable performances that perfectly fits the application requirements avoiding complexities on the carrier board. 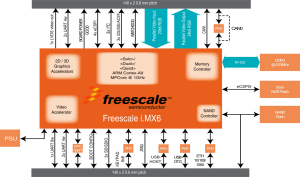 The use of this processor enables extensive system-level differentiation of new applications in many industry ﬁelds, where high-performance and extremely compact form factor (85mm x 50mm) are key factors. Smarter system designs are made possible, following the trends in functionalities and interfaces of the new, state-of-the-art embedded products. AXEL ESATTA offers great computational power, thanks to the rich set of peripherals, the Scalable ARM Cortex-A9 together with a large set of high-speed I/Os. AXEL ESATTA enables designers to create smart products suitable for harsh mechanical and thermal environments, allowing the development of high computing and reliable solutions. Thanks to the tight integration between the ARM Core-based processing system, designers are able to share the application through the multicore platform and/or to divide the task on different cores in order to match with specific application requirements (thanks to AMP is possible to create application where RTOS and Linux works together on different cores). Please visit Axel Esatta Web Page for more product information. This category collects all the pages specific to AXEL ESATTA modules and related carrier boards. This page was last modified on 10 November 2016, at 16:21.